This year, I got the opportunity to participate in an Industry presentation at INTERACT 2017. For the uninitiated, INTERACT is a renowned Human-Centered Interaction (HCI) conference that attracts researchers and practitioners from several countries and cultures. Taking place in India for the first time, INTERACT brought together many leaders, researchers and companies interested in the challenges and opportunities presented by emerging markets. “It is not surprising that a large number of HCI researchers and technology companies are showing immense interest in these emerging markets. 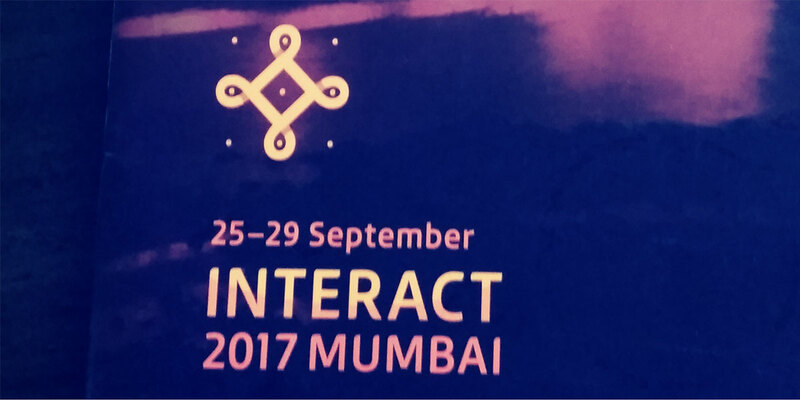 INTERACT 2017 will explore these challenges and opportunities.” – Interact website. When you’re at a conference and the keynote speaker starts talking about his belief in dreams, to enhance human cognition and of not being scared of technology but innovating it for human needs to improve the quality of life and instill happiness – you know at that point that you are listening to a true HCI advocate. This keynote speaker was Albrecht Schmidt, a professor of Human-Computer Interaction and Cognitive Systems at the University of Stuttgart. Mr. Schmidt’s talk focused on Amplifying Human Abilities with Digital Technologies. He gave a simple example of a pair of eyeglasses which enhances our ability to see and improves our quality of life by transforming a blurry world into a sharper, brighter world. Through his inspiring talk, Mr. Schmidt, encouraged us to move away from the fear of technology and instead embrace and use it to enhance perception and cognition. Academia has been futuristic, and inspirational, pushing us to dream more. However, I was part of an Industrial session, where I spoke on the practical challenges, implementation, and on-field happenings. I opened the session and spoke about Emotional and Motivational Aspects of Adapting to a New Technology based on our experiences working with new and existing products with an ever-evolving user base – and how we can learn to find the balance between new adapters while satisfying the existing user base. The other session was on User Testing Vs. User Teaching by Andrew White from IBM. I enjoyed Mr. White’s talk as he spoke about the importance of UX research and how they bring it in their design process – a thought which we have long been advocating at HUREO. One of the best parts of Interact 2017 was the many wonderful people I got to meet. INTERACT brought together the global as well as the local HCI communities, which are working in both developed and emerging markets and designing products that improve human lives, from public transportation to developing operating system that accommodate regional languages.